Updated at 2:53 pm ET (1953 UTC). Even though the flare peaked and quickly subsided, the proton flux at GOES as risen substantially. Here is the GOES protons fluxes (different colors are different energies). A flare at the limb shouldn't produce a large increase in the proton flux, but this one did! Another X-class flare is happening right now! AR 11402 has let loose with an X-class flare as it disappears over the limb. 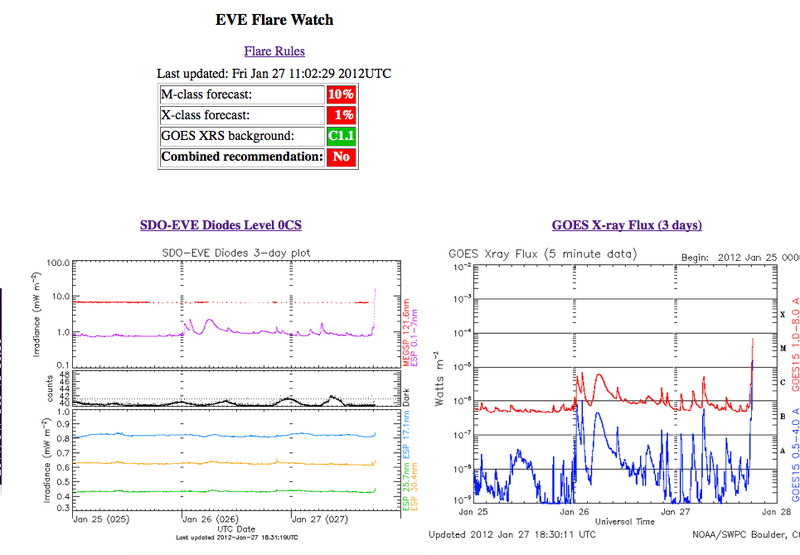 Here is the EVE flare watch page (on left) and the SWPC X-ray flux (right). It's a great week for Space Weather! Today we performed two maneuvers, the Guide Telescope calibration at 1500 UT (10 am ET) and a Delta-H maneuver starting at 1944 UT (2:44 pm ET). Both went off without a hitch. A Delta-H maneuver is used to keep the reaction wheels spinning within the limits set by the FOT. These wheels are used to keep SDO accurately pointed at the Sun. Reaction wheel speeds going into the Delta-H maneuver were [-980, 122, -318, -980] RPM; they are now [470, 470, -167, 167] RPM. There will be shaking seen in movies and there may be gaps during maneuvers. Due to work on the building at Goddard, the power to the room containing our website computer has been turned off. It will be turned on at noon today (or later.) Data continues to flow to the JSOC and EVE SOC. A paper was published in Science magazine today about watching the evaporation of C/2011 N3 (SOHO) seen by SDO/AIA to evaporate near the Sun in July (here is a time-lapse image of the comet moving across the disk of the Sun.) The article is at http://www.sciencemag.org/content/335/6066/324. There is also a comment (called a perspective) written by another scientist that describes the research paper. Many thanks to the FOT for finishing the new EVE Cruciform maneuver on Wednesday. The new algorithm gives the EVE science team better data is half the time. 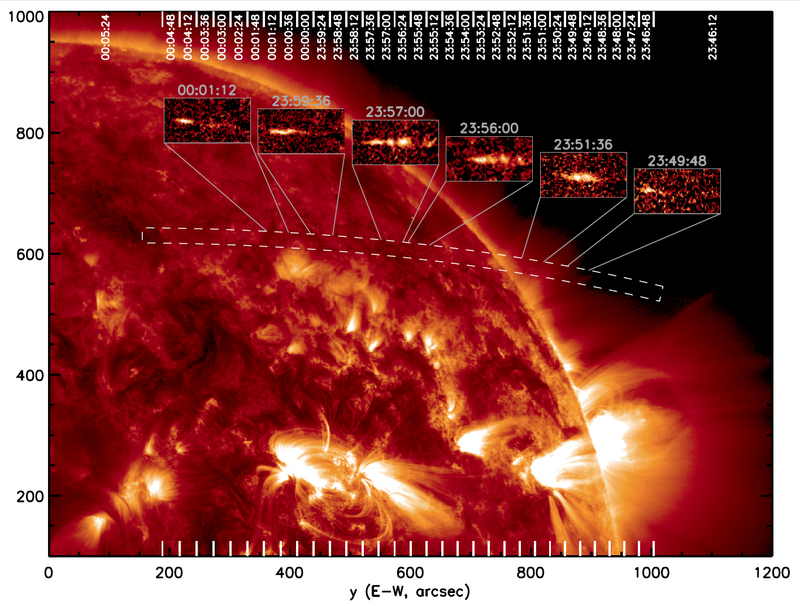 Articles describing SDO, the science investigations, and science data products are now available in Solar Physics. An overview of SDO is the first article. If you go to that link and pick Issue in the left column, you will see all of the articles in Volume 275. Most of the articles are Open Access, which means you can read them without a subscription. A book containing these articles will available later this year. 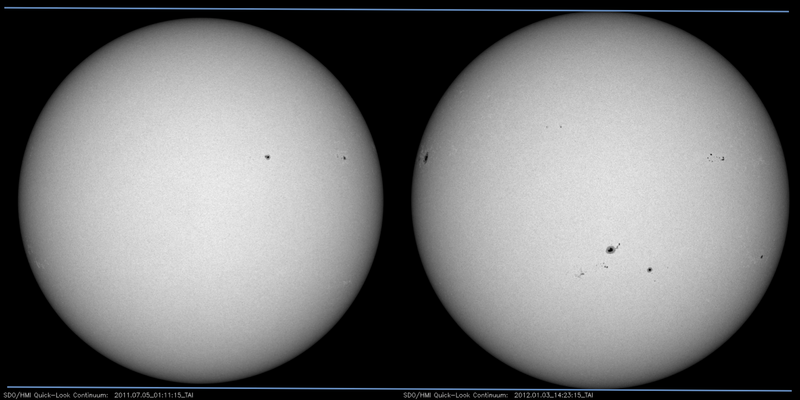 The shaking of the images on Wednesday was due to two image calibration maneuvers. The EVE Field of View started at 1315 UTC and after that ended the HMI/AIA flatfield started at 1630 UT. SDO returned to normal data operations at 1900 UTC. These maneuvers allow the scientists to calibrate their instruments and keep the data flowing. Tomorrow (January 4) at 8 pm EST the Earth will be at perihelion. This is the point in our orbit around the Sun that is closest to the Sun. Why do we care? Because SDO takes a lot of pictures of the Sun. At perihelion they appear a little bigger than they do at aphelion in July. Here is a comparison of HMI Quick-Look continuum images from January and July. The two horizontal lines show how high the Sun appears today. When those lines are extended to the left, the July image is a little over 3% smaller. When we designed the instruments on SDO we had to make sure the largest appearance of the Sun would fit on the CCDs. Looks like we did a good job! Have a Happy Perihelion Day!